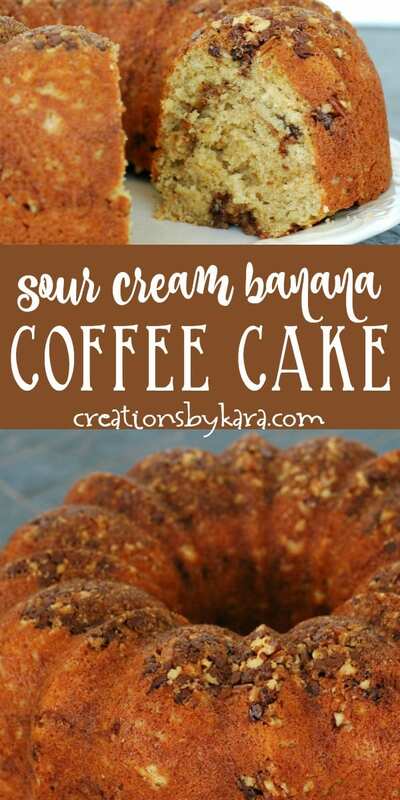 Sour Cream Banana Coffee Cake- This tender coffee cake has a subtle banana flavor, and is filled with a layer of chocolate, cinnamon, and nuts. The crunchy topping makes it extra special! When I end up with a bunch of overripe bananas, I love whipping up recipes like Banana Muffins, Buttermilk Banana Bread, and even Chocolate Chip Banana Cookies. 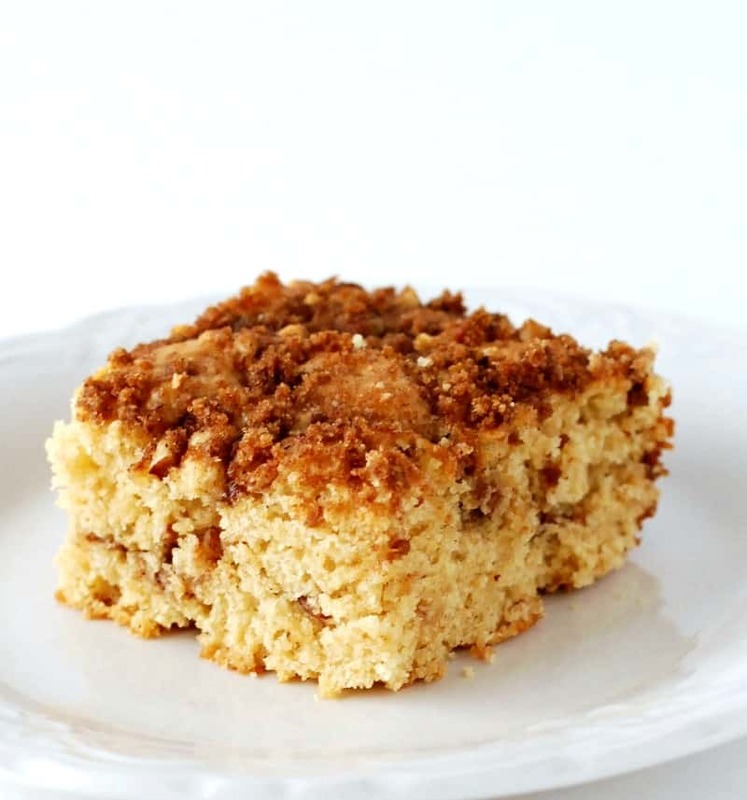 This coffee cake is a special morning treat I’m adding to the rotation. Winters in Utah are CHILLY, so when I have time (AKA Saturdays), I like to warm up the house in the morning by baking up a yummy coffee cake. 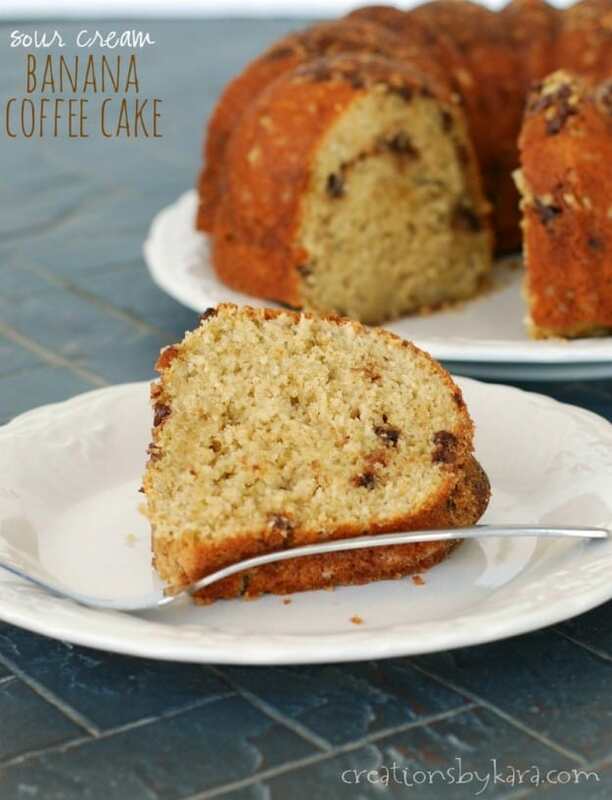 We had some over-ripe bananas, so I decided to whip up a batch of this sour cream banana coffee cake. I’m not always a fan of chocolate and banana together, but in this recipe it was perfect! 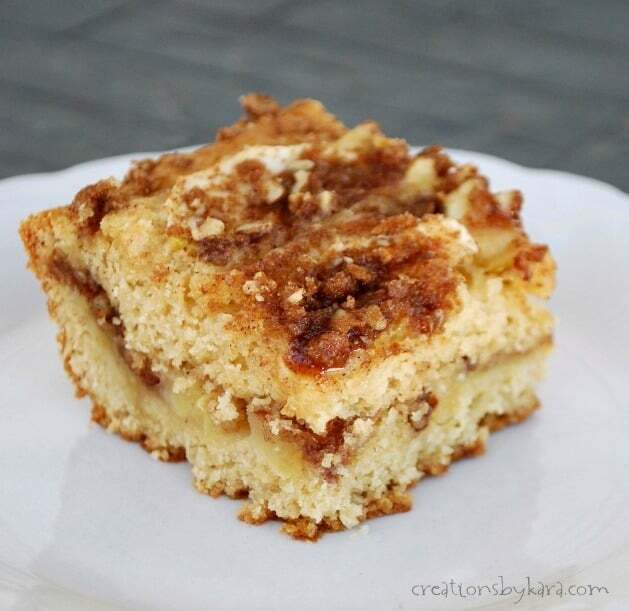 I can’t tell you how much my family raved about this yummy coffee cake! 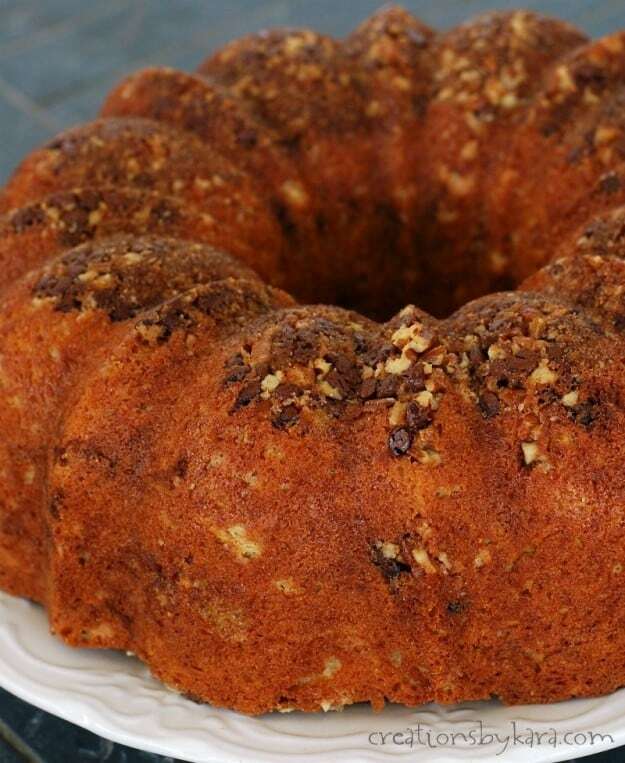 You sprinkle chocolate chips and nuts in the bottom of the Bundt pan, and it bakes into such a delicious topping. Doesn’t just make you want to rip off a piece and shove it in your mouth? Seriously so good! Paired with scrambled eggs and a fruit smoothie, it is a perfect breakfast that keeps my boys full all morning for at least an hour. Combine flour, baking powder, cinnamon, soda, and salt in a small bowl. Set aside. In a large mixing bowl, beat butter and sugar till creamy, about 2 minutes. Beat in vanilla, eggs, bananas, and sour cream. Stir in dry ingredients till just combined. Don’t over-mix. Combine all topping ingredients in a small bowl and stir till well mixed. In a well greased Bundt cake pan, layer 1/3 of the topping, then half the batter, then 1/3 of the topping and the remaining batter. Top with the last third of the topping. Bake at 350° for 40-45 minutes or until a toothpick comes out clean. 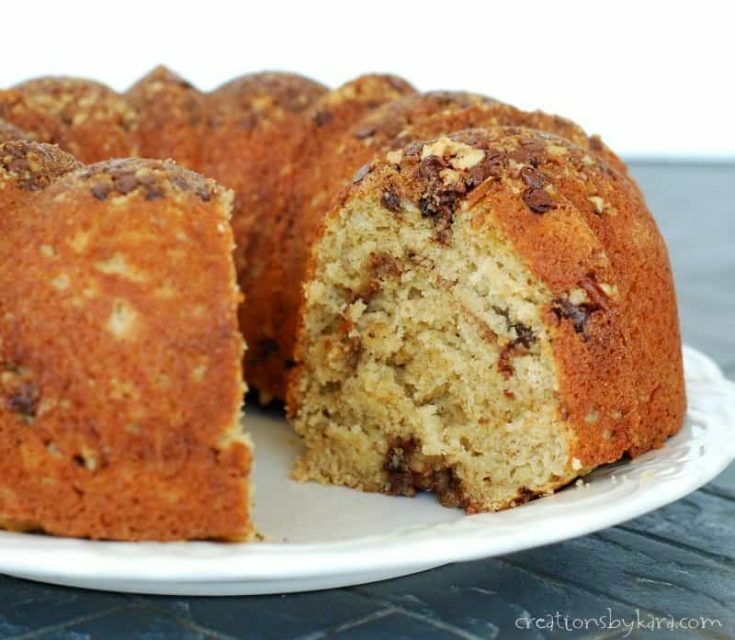 I am already stockpiling over-ripe bananas in the freezer so I can make this again. You really need to try it. And soon! 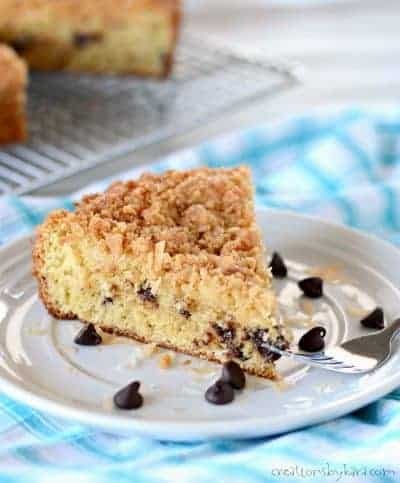 Tender banana coffee cake with a cinnamon chocolate chip nut topping. Combine flour, baking powder, cinnamon, soda, and salt in a small bowl. Set aside. In a large mixing bowl, beat butter and sugar till creamy, about 2 minutes. Beat in vanilla, eggs, bananas, and sour cream. Stir in dry ingredients till just combined. Don't over-mix. In a well greased Bundt cake pan, layer 1/3 of the topping, then half the batter, then 1/3 of the topping and the remaining batter. Top with the last third of the topping. To see all my breakfast recipes, click HERE. 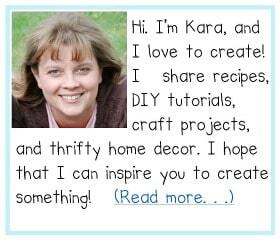 Thanks Becky, and welcome to the food blogging world. It’s a fun ride! my oh my how delicious!